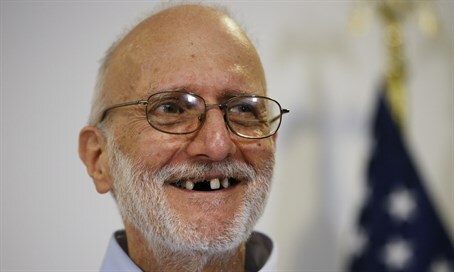 Alan Gross, who was jailed in Cuba for spying, says he was mistreated by his captors and felt abandoned by his own government. Jewish-American contractor Alan Gross says he was mistreated by his captors and felt abandoned by his own government after Cuba arrested him and accused him of spying, AFP reported Friday. In his first major interview since his release last year, Gross said exercise, family memories and humor kept him going though his five-year ordeal. "They threatened to hang me. They threatened to pull out my fingernails. They said I'd never see the light of day," the 66-year-old was quoted as having told CBS television's 60 Minutes. "I had to do three things in order to survive, three things every day," he said, in an excerpt from an interview to be broadcast in full on Sunday. "I thought about my family that survived the Holocaust. I exercised religiously every day and I found something every day to laugh at," said Gross. Gross was contracted by the U.S. Agency for International Development to deliver electronics to Jewish groups when he was arrested in Havana in December 2009. He was sentenced to 15 years in prison in Cuba in 2011 after being convicted of "acts against the independence or territorial integrity of the state" and later held an eight-day hunger strike to press for his release from prison. His release in December of last year for three Cubans held in the United States for spying set the stage for a thaw in ties between Washington and Havana, which had not had diplomatic relations in more than 50 years. Asked in the CBS interview whether he had thought that the United States government would find a way to get him out, he said, "Oh, I absolutely did for the first two weeks. "And then I said to myself, 'Where the hell are they? Where are they?' I didn't have any idea I'd be there for five years," Gross added. The United States government has always insisted Gross was not an intelligence agent but a development worker trying to connect Cuban communities to the outside world. A specialist in satellite communications, he had previously done such work in around 50 countries in Africa, Asia, Europe and the Middle East. He had visited Cuba four times before to his arrest, delivering computer and satellite gear to the communist island's small Jewish community. On his fifth journey he was allegedly in possession of an electronic chip that prevents governments from tracking the location of satellite telephone calls. In April, the American Supreme Court rejected an appeal by Gross who asked to sue Washington for negligence. The ruling upheld a decision in District of Columbia federal court which threw out Gross's suit seeking $60 million in compensation.